Here's The iPad 9.7'' Case Keyboard That Will Change Your Life! 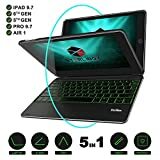 Don't like typing on your iPad's screen and yet you also don't want to add bulk or weight to your slim and sleek device? Well, we have designed a practical, stylish and premium solution that will cater to the needs of every 9.7'' iPad owner! 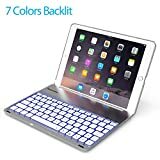 Presenting The Ultimate 9.7-Inch iPad Keyboard Case By Phixnozar By now, you should know that not all iPad Keyboard Cases were created equal. Here's why you should pick ours: FULLY ADJUSTABLE - Use the double-rotating hinge to flip and fold the cover to 360 degrees. INSANELY DURABLE - Made with premium Aluminum material which includes the keyboard AND the case. ASSEMBLES IN A SECOND - Just use the press buckle to assemble and disassemble the iPad in a moment's time. MATCHLESS PRACTICALITY - Includes 7 colors backlit keys and 2 sides breathing light that enables you to work even in dim light conditions. EXTRA-LONG WORKING TIME - 5 hours with the backlit on and 120 hours when the backlit is off. Fully Compatible With: 2018 iPad 6 (A1893/A1954) 2017 iPad 5 (A1822, A1823) iPad Pro 9.7 (A1673, 1674, A1675) iPad Air 2 (A1566, A1567) iPad Air (A1474, A1475, A1476) And The BEST Part? Our Backlit iPad Bluetooth Keyboard is accompanied by our 2-YEAR WARRANTY as well as our 100% 30-Day Money-Back Guarantee in case you encounter ANY issue with your purchase! Just Scroll Up, Click 'Add To Cart' And Make It Yours Today! The Sterlibox iPad Keyboard Cover for your iPadYour iPad does a lot for you but you could always get more out of it. One way to do this is accessorizing to make your iPad do more for you. The iPad keyboard case is an accessory that you just have to get to enjoy the full iPad experience. With a keyboard case, you can make your iPad into a notebook laptop and get all your typing done faster. 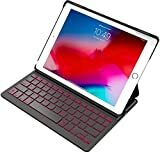 The Bluetooth iPad Keyboard is compatible with a range of iOS devices like the 6th generation and 5th generation 9.7" iPads and the iPad Air 1.Ultra Slim and PortableThe keyboard case is meant to complement your iPad in every way. It seamlessly blends with your iPad which easily slides into place to allow for faster typing. You will also like the fact that the keyboard is practically weight less allowing you to carry it so that you can use your iPad on the go. 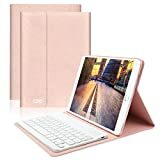 The case also has keys with the MacBook design which makes it easier to type more accurately.Sturdy FormThe iPad 2017 / 2018 / iPad Air keyboard has a strong build that guarantees long years of service before you have to worry about a replacement. Made from high-quality aluminum alloy and tough plastic, the keyboard offers clamshell casing that gives your iPad the extra protection it needs to keep it from scratching and also protects from spills. The case is also fitted with hinges that allow you to turn the iPad in ergonomic angles for comfortable usage. 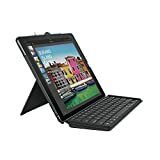 The adjustable cover has a 127.6-degree adjustable angle which makes it easier to type and view your device.100% Lifetime GuaranteeSterlibox iPad Keyboard Case is built to last with high-quality materials and an attention to detail and safety that exceeds market standards. Should your iPad Case with Keyboard ever break, we’ll replace them for you at no cost to you. 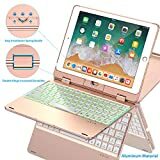 Favormates Wireless Keyboard Case for 2017 iPad 9.7" (5th Gen) / iPad AIR / 2018 New iPad 9.7" (6th Gen) - A protective keyboard case perfect for typing and reading. Intelligent Switch on/ off keyboard.Turn on: open the keyboard cover, the keyboard turn on automatically and all the indicator flashing on the keyboard.Turn off: close the keyboard cover, the keyboard will enter into sleep mode automatically. Great Connection and Portable design.1. Steady connection keyboard to let you type fast on iPad. (Click the combination key: " Fn"+" C" to turn on Pairing mode )2. Ultra slim design, thickness of key is 4mm, light weight and easy to carry.3. Clamshell bracket design to make your IPAD at the best viewing angle to meet your visual needs. Seven Color Backlight Design, High, Medium and Low 3 Mode Brightness Adjustment, Give you a Different Visual Enjoyment.1. Press to "brightness" button to switch the backlit, there are 4 modes, high, medium, low brightness and no backlit.2. The button on the right of "brightness" is to switch the led backlit color, there are 7 colors, blue, green, red, Cyan, purple yellow. White.Durable Battery Life The lithium-ion battery will provide up to 120 hours of continuous operation and up to 133 days of standby time. Compatible modesNew iPad 2018 9.7"(A1893 / A1954)iPad 2017 9.7"(A1822, A1823)iPad Pro 9.7(A1673, 1674, A1675)iPad Air 2(A1566, A1567)iPad Air (A1474, A1475, A1476)Package Content:1 * iPad Keyboard Case1 * USB cable1 * InstructionScroll back up and click the Add to Cart button, and get the last wireless new iPad 9.7" & iPad Air keyboard case you'll ever need, GUARANTEED. 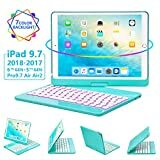 GREENLAW KEYBOARD CASE for iPad 9.7 2018,, iPad pro 9.7, 2017 iPad 9.7, iPad Air, iPad Air 2 Compatible Models: New iPad 9.7 2018(A1893 / A1954) iPad 9.7 2017(A1822, A1823) iPad Pro 9.7(A1673, 1674, A1675) iPad Air 2(A1566, A1567) iPad Air (A1474, A1475, A1476) FEATURES： ✔360 Rotate Stand Keyboard Case and 180 Degree Flip: Built-in hinges allow the iPad to be tilted up to 360 degree to provide the most comfortable viewing position. ✔3 kinds of diffrent using way.Uniquely ideal for home, work and travel. ✔7 LED colors backlights available, perfect for work in dark environment. ✔Hard shell case provides all around protection., no more scratches, no more accumulated dust! ✔ABS keys with silent, responsive X-type, standard keys layout which could meet your office and entertainment demands at anytime, anywhere. ✔Auto sleep/ wake to maximize battery life. ✔200 days standby time, 90 days continuous use, 20 hours using backlight on single charge. ✔Perfect Access to all Switches, Sockets or Camera. ✔Support iOS system. Full Shortcut keys accessible. How to get the keyboard sync with iPad? 1.Power on the keyboard by sliding the ON/OFF switch to ON position, the light comes on and then goes off. 2.Hold on Fn+C together. (The blue indicator would flash.) 3.Go to the iPad settings, click on "BT 4.0 Keyboard". 4.Select it. One year warranty and 30 days money back guarantee.